Have you ever been around a highly skilled “manipulator?” You know how they work. They know exactly what to say to get exactly what they want from you. They can be incredibly sweet or incredibly mean, depending on the situation. Manipulators are smart. They normally get their way and you don’t always see it coming. Today I am going to share one of my beliefs with you. I believe that Fred Phelps is a manipulator and a “false prophet” to his own people. I believe that his followers are genuine, but that he is not. I think he has an agenda that is much different from the one he talks about. Every action tends to bring about an equal and opposite reaction. I think it’s always wise to question motives, because if you look at situations as they seem to be, at first glace, I feel that often you miss the real story. If I were to tell you that Fred Phelps has advanced the homosexual agenda more than almost anyone else in this country’s history, over the last 30 years, what would you think about that? In all fairness I have been running temperatures of around 101° for the last 3 days so you might be able to make a decent argument for my brain being a little parched, but I don’t think that’s the case. Not this time. What has Phelps done in reality? He has raised awareness of the intolerance toward homosexuals by showing the ugly side of it. He has mimicked the “far right” stereotype of the inbred-church-going-bigot who is stuck in the 1800’s. He has made it look really uncool to dislike homosexuality. Would you agree with that? I absolutely understand that he is and always has been a registered democrat, by the way, which is why I think you should doubt his story even more. I think he is simply playing a part. And yes, as bad as we hate to admit it, he is trying to play the part of the stereotypical “far right” ultra christian hater. He is taking it to levels of the absurd to get the exact reaction he wants. Here’s the thing… I went to college in Phelps’ hometown of Topeka, KS and I can tell you that I think he is more likely to be a pawn of a larger movement than a nutjob who really believes in what he preaches. My belief is that Fred Phelps is actually an athiest, a communist, and a propopent of the New World Order. In the late 80’s, while at Washburn, I was well aware of the reputation of Gage Park. I was very much uncomfortable with the idea of homosexuals. In 1987 I was not prepared for an open embrace of homosexuality. I was fresh out of Catholic school and what was right was right, and what was wrong was wrong. That’s how I felt. Did I hate homosexuals? No. Just because I did not want to hug every gay person I met it didn’t mean that I hated them. It meant that these were not the people I would choose to hang out with, plain and simple. I wouldn’t spit on them or tell them they were going to hell, but I certainly would not go out of my way to associate with gay people. This was a very common feeling in 1987… Gay people are OK, just keep them away from me. So now we have this guy named Fred Phelps coming out of the woodwork and things started to change for many of us. This man seemed so full of pure evil that you could not possibly take him seriously. He was full of hate. He made good Christian people start to re-examine their own thoughts toward homosexuality and tolerance. Why? Because we didn’t want to be like Fred Phelps. He has helped to discredit Christianity. Again, I completely realize that most people in this country think he is nothing more than a typical lunatic. But I think you need to look at facts. Phelps started his career as a civil rights attorney. From day 1 he has always been about causing “division” in the public. Promoting division is a major calling card of the communist agenda. It’s the old “bait and switch” move. 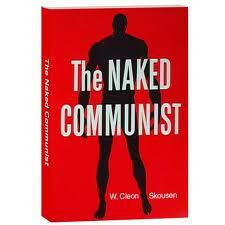 In 1958 Cleon Skausen wrote “The Naked Communist” which detailed 45 goals for the communist takeover of America. This list was entered into congressional record in 1963. In this book were 45 stated goals of the communist takeover of America. I want to point out a couple of goals that might directly relate to the ministry and teachings of Fred Phelps. Do you think Phelps has raised awareness toward homosexual lifestyles? Do people believe his words? Has he actually hurt the image of Christianity more than he has helped it? My contention is that this is exactly what he has done. Controversial opinions always get the most reaction. You are either running toward them or running away from them. Most people don’t want to be associated with Phelps in any way, so now you see an entire generation trying to separate itself from something it once thought was immoral. Now they are not so sure that homosexuality is immoral. They don’t want to think of themselves as another Fred Phelps after all. 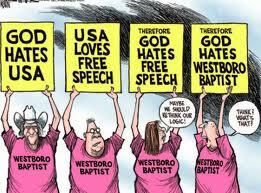 Have you ever wondered why they call themselves Westboro “Baptist” Church? Phelps and his followers are not Baptists. No Baptist organization in this country recognizes them. They are Calvinists. But Calvinism is not as popular as, for instance, the “Baptist” Church, so it is my belief that this is intentional. It is my belief that this is part of the agenda. I think it is a general mockery of Baptists and I think the usage of this word is very much intentional. I believe that Fred Phelps and his WBC followers are part of the communist movement. 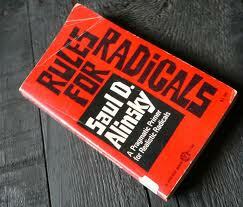 Have you ever heard of Saul Alinsky? He wrote a communist tactics piece called “Rules for Radicals” and if you look very closely at what Phelps is doing, he is using two of the tactics that Alinsky teaches. Phelps has been using the fourth rule (tactic) to soften Church views on homosexuality. Is homosexuality wrong according to the Bible? Yes it is. But through his insane acts of hate he has caused many churches to was to disassociate with a message of hate like his. When we want to distance ourselves from those viewed as “radicals” what do we do? We start to change our own policies and doctrines to put distance in between ourselves and these parties. He is using their own rules against them. The use of the fifth rule is where I believe that Phelps is more likely the evil genius than common bigot. This is a classic example of the use of ridicule. Phelps has not been ridiculing the homosexuals for 30 years nearly as much as he has ridiculed Christianity. This is why I also believe that he is an atheist. I don’t believe this man fears hell because I don’t believe that he acknowledges the existence of hell. I think all of his brainwashing is about a communist agenda. What percentage of people accept Phelps teachings on any level? Let’s give him a tremendous benefit of doubt and say it’s 5%. The man has received votes in major elections. In fact he once received 30% of the votes in a democratic party primary despite calling his opponent a “bull dike.” Over the years, as he became more extreme, his vote totals went down. But let’s say that 5% of the population is in complete agreement with Phelps. I think it’s probably less than 1% considering his church congregation has around 40 members, but I think we can agree that the percentage is likely small. So what do the other 95-99% think of Phelps? We think he is crazy and want to distance ourselves from him in any way possible. We start to question our own church teachings about homosexuality and wonder how Christianity could breed hate groups like this. We decide that we don’t really care about classifying ourselves as “Christians” and decide we will just be “good people.” We don’t need Church. We don’t need to be part of something that teaches hate. Has Phelps been ridiculing homosexuals for the last 30 years? No he has not. He has been ridiculing Christianity. That is my belief. It is my belief that Fred Phelps has been a major player in the societal decay of America by working to bring acceptance to homosexuality and discrediting the Bible. He just has a different way of achieving that mission, but there is no doubt that he has had an impact. Do I have proof of Phelps’ motives? No I do not. These are simply my opinions. But I want you to watch Phelps very closely. It is my belief that his team is more about providing distractions than about picketing. There are those on the internet who will tell you that Phelps is actually financed by the CIA or even George Soros. I don’t need to accept either of those conspiracies to see that something isn’t right here. I don’t have to believe that he is a member of the Illuminati to smell a skunk. How is it that we can have a young former marine like Brandon Raub, be arrested by FBI and sent to a mental institution from Facebook comments…while watching the WBC clan protected over and over by mainstream media and civil rights groups? They are like the poster children for the first amendment. Is it Phelps’ first amendment right to say these things? Unfortunately it is. But in a country that has very inconsistent rulings on the first amendment, you have to wonder how they continue to get by with the hate. My thought is that there are some really sick connections to some very important people that has left WBC somewhat bullet-proof. It’s the hypocrisy that we see that makes one think that Phelps has a special level of protection. Consider the case of Snyder v. Phelps. On March 10, 2006, WBC picketed the funeral of Marine Lance Corporal Matthew A. Snyder, who died in combat in Iraq on March 3, 2006. The Snyder family sued Fred Phelps for defamation, invasion of privacy, and intentional infliction of emotional distress. On October 31, 2007, WBC, Fred Phelps and his two daughters, Shirley Phelps-Roper and Rebekah Phelps-Davis, were found liable for invasion of privacy and intentional infliction of emotional distress. A federal jury awarded Snyder’s father $2.9 million in compensatory damages, then later added a decision to award $6 million in punitive damages for invasion of privacy and an additional $2 million for causing emotional distress (a total of $10.9 million). The organization said it wouldn’t change its message because of the verdict. The lawsuit named Albert Snyder, father of Matthew Snyder, as the plaintiff and Fred W. Phelps, Sr.; Westboro Baptist Church, Inc.; Rebekah Phelps-Davis; and Shirley Phelps-Roper as defendants, alleging that they were responsible for publishing defamatory information about the Snyder family on the Internet, including statements that Albert and his wife had “raised [Matthew] for the devil” and taught him “to defy his Creator, to divorce, and to commit adultery”. Other statements denounced them for raising their son Catholic. Snyder further complained the defendants had intruded upon and staged protests at his son’s funeral. The claims of invasion of privacy and defamation arising from comments posted about Snyder on the Westboro website were dismissed on First Amendment grounds, but the case proceeded to trial on the remaining three counts. They turned this funeral into a media circus and they wanted to hurt my family. They wanted their message heard and they didn’t care who they stepped over. My son should have been buried with dignity, not with a bunch of clowns outside. In his instructions to the jury, U.S. District Judge Richard D. Bennett stated that the First Amendment protection of free speech has limits, including vulgar, offensive and shocking statements, and that the jury must decide “whether the defendant’s actions would be highly offensive to a reasonable person, whether they were extreme and outrageous and whether these actions were so offensive and shocking as to not be entitled to First Amendment protection”. See also Chaplinsky v. New Hampshire, a case where certain personal slurs and obscene utterances by an individual were found unworthy of First Amendment protection, due to the potential for violence resulting from their utterance. WBC sought a mistrial based on alleged prejudicial statements made by the judge and violations of the gag order by the plaintiff’s attorney. An appeal was also sought by the WBC. WBC has said that it is thankful for the verdict. On February 4, 2008, Bennett upheld the ruling but reduced the punitive damages from $8 million to $2.1 million. The total judgment then stood at $5 million. Court liens were ordered on church buildings and Phelps’ law office in an attempt to ensure that the damages were paid. An appeal by WBC was heard on September 24, 2009. The federal appeals court ruled in favor of Phelps and Westboro Baptist Church, stating that their picket near the funeral of LCpl Matthew A. Snyder is protected speech and did not violate the privacy of the service member’s family, reversing the lower court’s $5 million judgment. On March 30, 2010, the federal appeals court ordered Albert Snyder to pay the court costs for the Westboro Baptist Church, an amount totaling $16,510.Political commentator Bill O’Reilly agreed on March 30 to cover the costs, pending appeal. A writ of certiorari was granted on an appeal to the Supreme Court of the United States, and the oral argument for the case took place on October 6, 2010. Margie Phelps, one of Fred Phelps’ children, represented the Westboro Baptist Church. The Court ruled in favor of Phelps in an 8–1 decision, holding that their speech related to a public issue, and was disseminated on a public sidewalk. Make no mistake. These people are highly intelligent and they know the law of the land. They know how to wiggle their way out of nearly any situation. I also have to believe they are very insulated. Think about what you just read. The decision started off as being for the plaintiff in the amount of 10.9 million. Then it was reduced to 5 million. In the end the plaintiff ended up receiving nothing and getting to pay the $16,510 court costs of Westboro Baptist Church. I am not an attorney and I can’t tell you whether this was legally the proper decision. I can tell you that I believe it was an unjust decision. These people are not obscure backwoods bigots. Oh no, make no mistake, Fred Phelps and the WBC clan know exactly what they are doing. I don’t believe they have ever been about discrediting “fags and fag enablers.” I believe Phelps and company is just part of a much larger machine that has been put in place to destroy the United States of America by any means possible. Their job was not to discredit homosexuality but to bring genuine tolerance toward it and discredit Christianity at the same time. Looks like they have very much succeeded in that quest. I can’t give Fred Phelps 100% of the credit for that, but I believe he was as instrumental as anyone in this new societal paradigm. Never in my life did I expect to see homosexuality glorified. That is exactly what I am seeing today. My own views on the subject have evolved, for better or worse, and it just makes me wonder…am I just another “useful idiot” who has served to be part of the problem rather than part of the solution? I believe there are far less coincidences in life than people think. Am I crazy? Quite possibly yes. But whether or not my theory about Fred Phelps holds any water, there is definitely a real conspiracy at play to take down the United States of America. Watch the documentary that is changing the way people think about their government. This entry was posted in Uncategorized and tagged Baptist, Fred Phelps, Naked Communist, Phelps, Saul Alinsky, Topeka Kansas, WBC, Westboro Baptist Church. Bookmark the permalink. 13 Responses to Is Fred Phelps a Common Bigot? Or an Evil Genius? Not PsyOps 101 (probably a more advanced lesson); but mastering the societal double-negative is really pretty accomplished. I tend to agree that powers greater than Phelps are involved. There is a book used as a blueprint for the goals of homosexual activists. It’s called “After the Ball.” One of the goals is, “Portray opposing churches “as antiquated backwaters,” badly out of step with the times and with the latest findings of psychology.” (page 179). It also calls for the “bracket technique.” For example, for a few seconds the media shows an unctuous beady-eyed Southern preacher pounding the pulpit in rage about “those sick, abominable creatures.” While his tirade continues over the soundtrack, the picture switches to pathetic photos of “gays” who look decent, harmless, and likable; and then we cut back to the poisonous face of the preacher, and so forth. The contrast speaks for itself. The effect is devastating. And Westboro fits this tactic like no other. I got through the first paragraph before I busted out laughing…dude, this is freaking GENIUS! Best deductive reasoning I’ve ever seen! Brilliant theory, just brilliant! Before reading this, I just considered him a wacko. After reading this very well put together argument, I believe you just might be on to something! I hope you feel better soon! I follow you and your writings with interest. This is certainly compelling. As a gay man, I could tell you stories of “punch-counter punch” from dusk to dawn. You are spot on. I call it all the Progressive Agenda. It’s sick, it’s evil and it is very deliberate. And well funded. Very well funded. It is what it is. Unfortunately gays are marginalized within the Conservative party. Truth be told the vast majority of gay people want their sexual lives left alone. As do, I would assume, heterosexuals. There is a huge, absolutely huge number of gays and lesbians who vote conservatively and support the constitution and support the fact that we are a Christian nation. They cannot say that though. They’d be called out from the left as being unappreciative of the lefts efforts on their behalf and they’d be ridiculed from the right as being impostors as all gay people are evil or pedophiles. So there they sit. Cash in hand. Great, hard working minds, usually in the forefront of business and development, heavily tilted to technology. And to my point, division. Another Progressive objective. I view it as a tremendous shame. No one, you, my neighbors, my government, or anyone else should be concerned with what transpires within my bedroom. And I respect that what others do in theirs, is none of mine. We should all focus on our COUNTRY and her health. If we do not, none of us, none of us is going to have any rights worth living for. I appreciate your deep dive on Phelps and WBC. You are an educator and a fearless one. And that, sir, I respect! Continue your hard work. I share you at every opportunity I have. Your having and impact! Feel better. 101’s and 2’s should not be left unchecked! Your theory would explain A LOT — including how “fake” Phelps seemed when I have had the bad luck to encounter him in person in Topeka. I do believe you are correct, Dean — and now I’m kind of embarrassed that I never figured it out for myself! The “Agenda” documentary should be required reading. Thank you for sharing the link! But your “theory” kind of validates my feelings on there being “something more” to the story. I love the Internet so much. You can find out really quickly that the gov’t is lying about everything. I love the fact that they constantly tell us in the media that we are the minority in this Country. We are not the minority. We are the majority and I am so glad to know that we are in this together. We the People WILL succeed! Really? He seems like your kind of person to be quite honest. He’s a self-important, hateful old bigot, who thinks he has the ears and hearts of the people. Sounds like your long lost twin. Who you talkin’ to, Taint? For a definition of “hateful,” read your own damned post and compare yourself to Phelps.